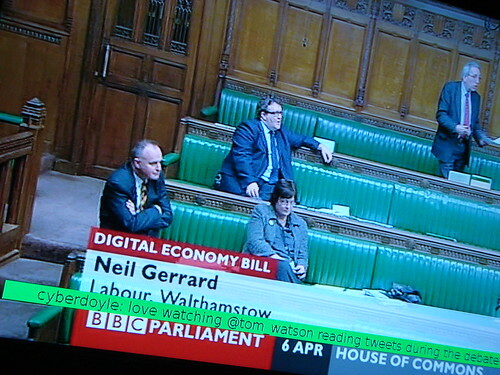 As a lot of other people, I’m watching the debate of the Digital Economy Bill on BBC Parliament tonight. I’m also trying to follow along with some of the #debill back-channel on twitter. With such a heated and interesting commentary on twitter, it reminded me of Roo’s “Second screen” idea of having tweets with a specific hashtag next to the TV during live TV events, when following the twitter backchannel during ‘The Apprentice’. And it seems to do the trick. This entry was posted on Tuesday, April 6th, 2010 at 7:59 pm and is filed under code. You can follow any responses to this entry through the RSS 2.0 feed. Both comments and pings are currently closed. Great! 🙂 I couldn’t keep up with the tweeting they were coming in so fast. How fast would it have needed to run to cope with the 100 or so every 30 seconds which were streaming through last night? 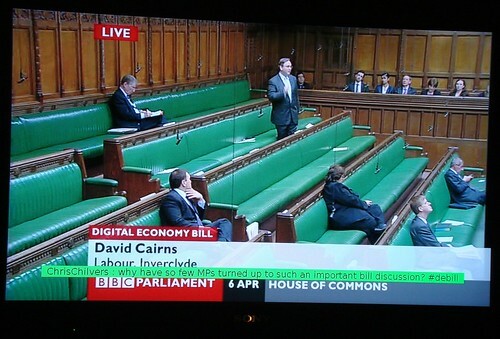 May I use your image of view of the empty House plus twitter feed in a ‘wrap up’ blpog post next Sunday? Please feel free to use the image – bigger res version of it on flickr if that helps. Tony – thanks for the link – that looks brilliant! Dale: are you using polling for this? Because you could quite easily use the live streaming API. It’s Ruby not Python, but here’s the code I use to pipe Twitter into IRC. It uses the TweetStream library in Ruby. There’s definitely something similar in Java and most likely there’s something similar in Python. Thanks very much for that, Tom. I am polling, and that looks like it’d be a much better way of doing it. I’ll have to have a play with it.